The graph above represents the price per square foot of sold homes in south La Quinta, California from 1998 through April, 2010. The straight blue line represents an annual 4.5% appreciation rate, which, according to the National Association of Realtors (NAR), has historically been very close to the actual sales data and when graphed, mirrors actual sales from as long ago as the 1960’s. The red line is the actual price per square foot of those homes that sold from 1998 through April 2010. The “Bubble” started in 2002, peaked in 2006 ($343.66) and started to really crash in 2007. At the peak in 2006, the homes were selling 186% of what is considered normal. In August of 2009, the “actual” line first fell below the “normal” line and stayed below until December when it crossed back above the “normal” line as inventories began to shrink. During the one month of October 2009, the average price per square foot was down to $173.66 – 17% below the “normal” line or a 49% decrease from the high – but that was just one month. The 2009 average finished the year only 3.99% above the “normal” line. The 2009 average price per square foot ($219.56) is below the half way point between the average price for the years of 2003 ($205.48) and 2004 ($239.72). While the 2009 average finished the year slightly above the “normal” appreciation line, looking at the 2009 sales by month shows that the price dipped below the “normal” appreciation line in August for the first time since August 2000 and only came back up above the line with a strong rebound in December. According to the NAR, we should not expect the price to go much below the “Normal” line and with today’s record low mortgage rates, bolsters the feeling that values have returned to where they should be and that this is a great time to buy! Also, NAR reported that nationally, “Pending” home sales decreased 7.6% in January from December, 2009 but have had a 8.2% surge in February. The decline was the first in 10 months and is blamed on the severe weather all across the country and likewise the strong rebound can be attributed to the arrival of Spring. Before January’s numbers, the previous 9 months were the longest string of increases in the index since it began in 2001. “Pending” sales are those that are under contract but have not yet closed. Since the average escrow is between 45 and 60 days, the decision to buy a home that appears as “sold” (closed escrow) today was likely made 1.5 to 3 months ago. “Pending” homes is a much more current number. Another bonus is that mortgage rates are at record lows and mortgages are becoming easier to get as lenders are getting more comfortable with the latest regulations. 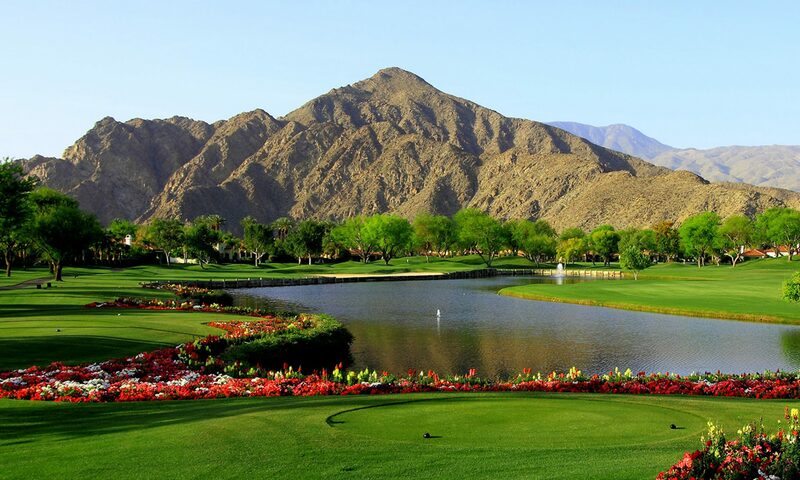 Here are the latest sales numbers for all homes sold within the city of La Quinta as well as all Golf Course homes in La Quinta through April 2010. The blue lines represent 2008 data, the orange lines represent 2009 data and the magenta lines represent 2010 data. The chart above shows monthly sales of homes within the city of La Quinta*. The sales for La Quinta in April were the strongest since May, 2006. We continue to notice an improvement in consumer confidence and an increase in buying activity in homes over $600,000, which has been slow over the past 18 months. Personally, our team has put many non-distressed, “regular” home sales together in the last 3 months, which has been a welcomed change. Prices have not come up, but perhaps they are coming closer to stabilizing as buyers are starting to seize the well-priced homes on the market. The sales-volume numbers in the higher-end market (which contains many of the golf properties in the chart above) continues to slowly improve as well. Sales in April were the strongest since May, 2008 and continue their rising trend. This is a great sign. We look forward to an even stronger May. Overall, we are seeing some positive signs in the market place. Although prices have not yet stabilized in the higher end (over $1 million), there are signs of stabilization beginning in the lower market segments. The mortgage industry is still a stumbling block in the higher end market as it seems that unless you can prove that you don’t need a Jumbo Loan (over $500,000), you can’t get one! The bottom line is that at the beginning of the downturn in 2006, there were over 10,000 homes available for sale in the Coachella Valley – a real glut, currently, that number is down to under 5,800. As the supply dwindles, the market begins to stabilize and people feel more comfortable to get back into the marketplace. If buying property is something on your list (especially golf property), why not take advantage of the incredible prices and seller incentives now, when sellers will work with you, instead of in the future, when the demand starts to catch up with the supply? Especially if you’re buying and planning to hold for 5+ years. * When looking at “sold” data, you have to remember that the numbers are generated on the date that the sale is recorded with the county but that the decision to buy was made about 45 – 60 days earlier. Old Town, La Quinta (which is actually new) is a great destination to visit while in the La Quinta area. It is composed of several streets of small and unique shops as well as gourmet restaurants and offices all built using Spanish architecture. Old Town is yet another example of how La Quinta is trying to be relavant. The Village of La Quinta, located between Washington Street and Eisenhower and Calle Tampico and Avenue 52, has several restaurants, with everything from casual dining to gourmet, Mexican to French to American to Seafood, Banks, a Hardware, Old Town Celler & Wine Bar, a village park with playing fields, a Post Office, Police Station and a lot of nice people – a little bit of everything you might need. On April 24, 2010, some special visitors, who were in town for the annual “Stage Coach” country music festival held at the Empire Polo Grounds that weekend decide to pay Old Town a visit. The Cap & Trade law that we are hearing about on the news (or not) is basically a law that will legislate a cleaner environment. It rewards “green” companies and taxes not so green companies. The law is very complex and I clearly have not read it all but… I want to alert you to one provision that will some day affect us all. The law provides for the setting up of yet another governmental bureaucracy that will send government inspectors to your home when you list it for sale and inspect it to make sure your home is compliant with all the current “green” laws and if it is not compliant, the home owner will have to bring it up to standards before it can be sold. This probably (hopefully) won’t be a big deal if you live in a home only 4 – 5 years old but how would you like to be living in a 150 year old New England farm house… or even a 30+ year old home in the La Quinta Cove? We all need to keep an eye on these new laws some of them will have a devastating affect on our future! The bottom line is that if you upgrade today using the example above, you will save $315,000 in upgrade cost and you will save $7,875.00 per year in property taxes because you bought your new home for $630,000 less than you would have in 2006. Better Weather in The Desert! Hi Everyone! Happy October 1 in the Desert! The hot, hot weather seems to have suddenly disappeared and we are just starting to have some beautiful days. Today it is supposed to be in the 80’s. The days are beautiful and sunny as always, but now it is almost back to the Desert that beckons us outside. I say “almost” because we are now going through the grass change time, or the more appropriate name being “scalping time” on the golf courses. This is when the summer golf course grasses (the bermuda grass) are let to go dry and die. Then the dead grass is scalped down to the dirt and new winter grass (rye) is planted. Within a few weeks the grasses turn a beautiful green and the new “Season” is upon us. So, with all this being said, now is a great time to come to the Desert, not sweat to death, and buy a home while they are still great deals, and before the season begins and the crowds arrive! The following article from the Associated Press “Tips for borrowers dealing with loan servicers” gives some great tips on how to proceed with a home loan modification and some things you should do to stay on top of the task. If you would like to explore different avenues of relief from high mortgage payments, please contact us about our “Homeowners Relief Program”. Here are the latest sales numbers for all homes sold within the city of La Quinta as well as all Golf Course homes in La Quinta through July 2009. The blue lines represent 2008 data and the orange lines represent 2009 data. The sales for La Quinta in July are very close to June’s numbers and remain just under where we were in 2008. We continue to notice an improvement in consumer confidence and an increase in buying activity in homes over $400,000, which has been slow over the past 18 months. Personally, our team has put many non-distressed, “regular” home sales together in the last 3 months, which has been a welcomed change. Prices have not come up, but perhaps they are coming closer to stabilizing as buyers are starting to seize the well-priced homes on the market. The sales-volume numbers in the higher-end market (which contains many of the golf properties in the chart above) continues to slowly improve as well. June and July have been the 2 best months of the year and July was ahead of the same month last year for the first time in 2009. This is a great sign. While August is traditionally the slowest month of our year, we have remained busy — it will be interesting to see how August’s numbers look. Overall, we are seeing some positive signs in the market place. Prices continue to be soft, but sales-volume remains consistent. If buying property is something on your list (especially golf property), why not take advantage of the incredible prices and seller incentives now, when sellers will work with you, instead of in the future, when the demand starts to catch up with the supply? Especially if you’re buying and planning to hold for 5+ years. Here is our latest sales report for all homes sold within the city of La Quinta as well as all Golf Course homes in La Quinta through May 2009. Here are the latest sales numbers for all homes sold within the city of La Quinta as well as all Golf Course homes in La Quinta through June 2009. The chart above shows Monthly sales of homes within the city of La Quinta. When looking at “sold” data, you have to remember that the numbers are generated on the date that the sale is recorded with the county but that the decision to buy was made about 45 – 60 days earlier. Although the sales in June are still lagging behind the same period in 2008, the number is very close to May’s number and continues to be leading this years recovery. We continue to notice an improvement in consumer confidence and an increase in activity in the higher priced homes brought on by two factors. The continued improvement of the markets on Wall Street and the falling prices of homes. An interesting statistic this month is that the decline in price per square foot of “all” LQ homes increased slightly. This is directly related to the scarcity of distressed properties – foreclosures and “short sales” – that tend to bring down the market value of the homes being sold. Earlier this spring, the government sponsored a moratorium on banks releasing foreclosures to moderate their downward affect on the housing market. That moratorium has been lifted but we still haven’t seen the expected flood (or even a wave) of distressed property hit the local market yet and, in fact, the “distressed” inventory currently remains very low. The number of homes sold in golf course communities in La Quinta has decreased since this time last year but continues its steady climb upwards. While the lower end of the market has been extremely active ($400,000 and below), the upper-end (which contains many of the golf properties in the chart above) continues to be sluggish but is improving. June and July have been the 2 best months of the year. Because of the sluggishness of this higher end market there are many really good deals available. If buying a golf property is something on your list, why not take advantage of the incredible prices and seller incentives now, when sellers will work with you, instead of in the future, when the demand starts to catch up with the supply? Especially if you’re buying and planning to hold for 5+ years. Unit sales in 2009 are lagging behind the same period last year reflecting the downward trend of the general housing market. Please remember that the decline of the real estate market greatly accelerated in September 2008 when our economy went into crisis and consumer confidence disappeared. We are now, 8 months later, beginning to see increased activity; a trend that many economists believe will continue to grow in the next several months. With home prices as low as they are now (pre 2004), and capital starting to flow back into the banking system, tremendous opportunity exists right now for buyers in all spectrums of the market. McLean, VA – To help borrowers who have seen significant home price declines refinance their existing loans, the Obama Administration today announced the availability of loan-to-value (LTV) ratios up to 125 percent for Home Affordable Refinance mortgages, including Freddie Mac’s Relief Refinance MortgageSM. The previous maximum LTV ratio for Relief Refinance Mortgages had been 105 percent. As a result of this change, qualified borrowers will be able to obtain Relief Refinance Mortgages with loan amounts up to 125 percent of the current value of their property. The higher LTV ratio is expected to give homeowners – especially those in markets that have experienced sharp declines in home values – more options to refinance into mortgages with terms that better position them for long-term homeownership. To encourage borrowers with 30-year fixed rate mortgages to consider a shorter 25-year term, Freddie Mac is providing a special price incentive to lenders. The incentive only applies to Relief Refinance Mortgages with LTV ratios between 105 percent and 125 percent. The 25-year term will result in borrowers paying less interest over the life of their loan and improving their overall equity position over time (something one faces when dealing with 1 hour payday loans). Freddie Mac’s Relief Refinance Mortgage is available to borrowers who are current on mortgages that are owned or guaranteed by Freddie Mac. Borrowers should visit https://www.freddiemac.com/corporate/ and complete the online form to determine if Freddie Mac owns their mortgage. Freddie Mac’s Relief Refinance Mortgage allows borrowers to finance closing costs, financing costs and prepaids/escrows up to $5,000 or 4 percent of the current unpaid principal balance of the mortgage being refinanced, whichever is less. Mortgage insurance (MI) is not required if the existing mortgage does not require MI. Otherwise, MI coverage on the new loan must be the same as on the original mortgage. Borrowers who apply for Relief Refinance Mortgages through their current servicer will not need to be re-underwritten in most cases. When borrowers apply for Relief Refinance Mortgages through lenders other than their current servicer, the lender must re-underwrite the borrower through Loan Prospector®, Freddie Mac’s automated underwriting service. The expanded LTV ratios are available now when borrowers apply for Relief Refinance Mortgages through their current servicer and will become available on October 1 when borrowers apply through any lender affiliated with Freddie Mac. Freddie Mac also said the resulting impact on prepayments for certain Freddie Mac Mortgage Participation Certificates, or PCs, may vary, depending on borrower response and other factors.